A consortium of Dutch drinking water companies has been working intensively for years through VEI, with support from the Dutch government, with FIPAG, Mozambique's national water company. This cooperation is aimed at building an effective organization and training its employees. "That now seems to be paying off," says Wilco van der Wal, VEI's Resident Project Manager in Beira. “A miracle has happened in the last three days with unified forces. The drinking water supply for the city Beira is up and running again after the devastating power of the cyclone Idai. “Emergency aid is always very important but, in the end, not sustainable. So, Beira must also be able to fall back on their regular drinking water system.” Together with FIPAG, VEI has developed and rolled out a step-by-step plan to restore water intake from the source and to put the transport pipeline back into operation. The pumps are currently being operated with emergency generators. 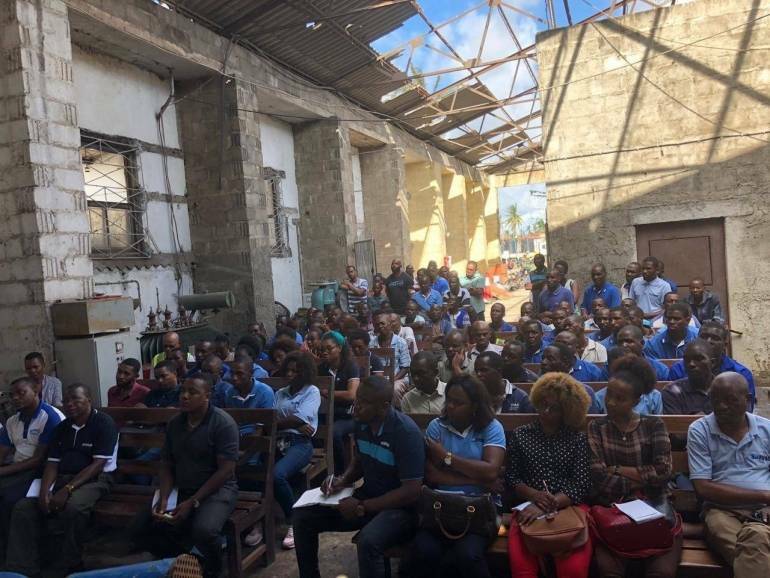 The CEO of FIPAG (> 2,000 employees) has placed himself in Beira and directs his people to roll up their sleeves in a totally destroyed office where computers float in the water. And even though VEI experts sometimes grumble about the slowness of action, now in this crisis period FIPAG shows class and resilience: day and night, people worked with power. And with result: FIPAG is very grateful to the Dutch government for its long-term support. Not the crisis approach, but an approach aimed at sustainably strengthening his organization that he can now fall back on. Since this weekend, safe drinking water is flowing back into town. This is the best guarantee to reduce cholera. However, much has broken in the pipeline network. Not only by Idai but also by people who dig up pipes and break them in order to gain access to drinking water. With additional teams, VEI will be working with FIPAG on public taps and the restoration of the pipeline network so that everyone can have access to drinking water again. "The fact that Minister Kaag has promised € 1.8 million to these first response actions in such a fast and adequate way deserves praise," said Siemen Veenstra, Regional Manager Africa at VEI.